"You know when your college counselor asks what you'd do if money wasn't a factor? Well…we'd eat burritos," Leo Kremer says. "And this?" he gestures to the burrito-rolling station in front of him. "This is about as close as it gets to that." Leo, 34, and his younger brother Oliver, 29, are the founders of Dos Toros Taqueria, a Bay-Area style burrito chain that began as a single location off of New York City's Union Square in 2009. So far, their shared, wacky instinct – to somehow turn an intense passion for burritos into a legitimate career opportunity – is paying off. In a potentially very big way. Dos Toros's seventh location opens this month. Situated on Lexington and 45th Street in the heart of Midtown Manhattan, at 2,300 square feet, it's their biggest space yet. The last couple years have been a crazy time for Dos Toros, but if everything goes as planned, all of this activity will look quaint when compared with what's coming: four new locations by the end of the year, and an expansion to another city within the next two. Dos Toros Tacqueria, Park and 23rd. "We like Philly, Boston, D.C., Chicago," Oliver says, and then, musing out loud, "London's great." It's 10:30 a.m. on a frigid, blustery Tuesday in mid-February three weeks before the grand opening of the new location. Leo and Oliver are on a downtown 6 train, en route to check-in on their recently opened restaurant on Park and 23rd Street. Their morning was spent touring the Lexington Avenue construction site, where they were given a detailed walk-through by their contractor. As the subway car hurtles downtown, stopping to spit out and absorb commuters, they debate the merits of each locale. Boston is packed with college kids, a plus, but "it already has Anna's," Oliver says, a local taqueria chain that serves up flavorful, well-respected burritos. D.C. is a frontrunner, although Leo is partial to Philadelphia, because "investors are more impressed if you succeed there -- they think it's more representative of the average American city." This is important; for the first time, the brothers are considering taking on an outside investment. Until now, they've been self-funded, taking out debt and investing their cash flow (they are on target to earn $20 million in revenue this year, after bringing in somewhere "in the low teens" last year) back into the business. "Right now we have an SBA loan, which is great. But that's going to run out pretty soon," Leo says. In many ways, the brothers are still winging it. "Fundamentally, we don't really know what we're doing. We've never done this before," Leo says. "So it's about trying not to make mistakes, and trying to get advice from smart people." Originally, the focus was entirely centered on opening a single quality burrito joint, but Dos Toros's popularity has widened that lens to include visions of a chain that will eventually span both coasts. "We can open five a year for the next five years, and move to multiple cities," Leo says. "So if we can be at 20 or 25 locations in four years that would be awesome." Oliver Kremer preparing a burrito. In 2009, if you told Leo and Oliver that Dos Toros could, one day, make its way to the West Coast, they would have just laughed. The brothers are West Coast natives. They grew up in Berkeley, Calif., where their favorite activity, as they tell it, was eating burritos at Gordo Taqueria, a local establishment that serves subtly seasoned, brick-sized burritos stuffed with beans, rice salsa and melted cheese. And so they poured their energy (and their savings, as well as investments from friends and family) into that first location off of Union Square. Both took jobs for a few months at local New York tacquerias to get a feel for the business. "Because we had eaten so many burritos, from the customer side, we already had the whole thing mapped up," Leo says. "It was reverse engineering. We didn't know anything except what it should look like, taste like and feel like, so at first it was like, how the f*ck do you build a restaurant?" They figured it out as they went, hiring an experienced contractor and restaurant lawyer, and learning the ins-and-outs of negotiating a lease, and working with a chef to come up with all their recipes. They chose the name Dos Toros, which means “two bulls” in Spanish. "Things fell into place. Piece by piece we put it together." Leo and Oliver are strictly guided by their own taste and preferences. While they're pleasantly surprised to see that a wide range of people line up for Dos Toros, "I still think our core customer is probably a guy in his 20s or 30s -- that's what we are," Leo says. "Whenever we have to make a decision about Dos Toros, we ask 'what do we want?'" The food tastes the way they like to eat it. The chain's aesthetic – clean and modern with black iron details and rustic wood benches and stools – is designed to be a place they think looks "groovy," and each new location has to be situated in a neighborhood they could see themselves frequenting (which is why there is a Williamsburg restaurant, but not a Staten Island one). It's 10:55 a.m., and the brothers are chatting with the staff at Dos Toros's Park and 23rd location before the doors open at 11. Leo stoops over an employee's phone to check out a picture of his newborn baby, while Oliver ducks behind the bar to make himself a salad. Leo and Oliver Kremer chatting with employees. As he sits down and digs in, Leo pulls up a chair and finally addresses the elephant in the middle of any discussion about Dos Toros: Its name, of course, is Chipotle. Dos Toros's core customer base -- those hipster dudes in their 20s and 30s like Leo and Oliver -- tend to love Chipotle. Online reviews of Dos Toros are riddled with Chipotle comparisons. "This place blows Chipotle away, the meat and ingredients taste so fresh and crisp," writes one reviewer on Yelp; agrees another, "you can't help but compare this place to Chipotle. The portions are about the same, though the menu is scaled down and, admittedly, the ingredients here [taste] slightly more fresh," while another is even more direct: "I can't imagine being any more similar to Chipotle without infringing some kind of legal issues." These reviews make complete sense, of course. Both chains are fast-casual Mexican with a limited menu best known for their burritos. Both use fresh, sustainably sourced ingredients and sport a modern, minimalist vibe. Related: Shake Shack IPO Is Hot But Can It Match Chipotle? And it turns out that like most of their peers, Leo and Oliver are Chipotle fans. When Dos Toros opened in 2009, Chipotle had already opened 37 restaurants in the state of New York, many of which were in New York City; the brothers speculate that its presence probably helped them: "If anything, Chipotle has grown the category," Oliver says. "If they had never come here I think a lot of people would be like, 'well what is a burrito and why do I need it?'" For the most part they like the way Chipotle tastes, too. "Look, it's really good food, it's just not what we grew up eating," says Leo. Because in spite of all those reviews that equate the two chains, they don’t think their flavors are similar. While Chipotle "tastes really clean" with lots of cilantro and citrus notes, their food has "a lot of umami flavor." After that, the differences get finer: "Their tortillas are too thick, I think. Chipotle's dirty secret is how much salt they use," Leo continues. "They use a lot of sodium: in their rice, guacamole, salsa, and meat, which can taste great. I don't want to call it cheating to use that much salt, but…let's just say we're a less salty choice." Dos Toros guacamole and salsa. Peccadillos aside, Leo and Oliver are using the Chipotle model as a template. Like the Denver, Colo.-based company, they have no plans of franchising. The chains they most admire – In-N-Out, Sweet Green, Chop't and, yes, Chipotle – have all maintained company ownership. "What they do --what we do --is hard," Oliver says. "You need control to keep the quality up." 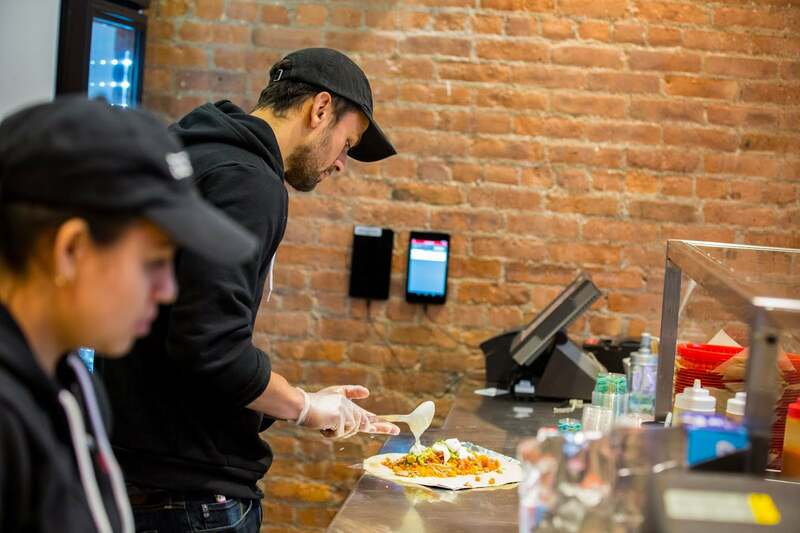 They also keep track of cities and neighborhoods where Chipotle is doing particularly well; D.C. is a serious contender for expansion plans outside NYC because "Chipotle is killing it there," Leo says. 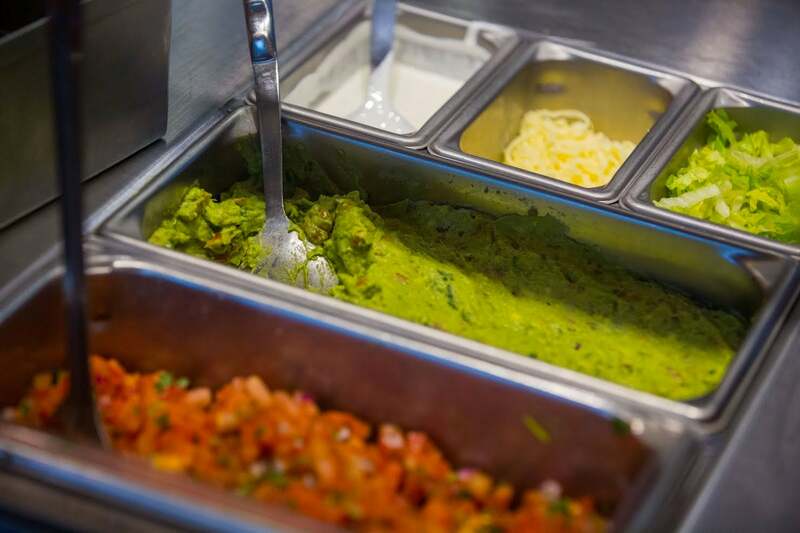 And like Chipotle, while Dos Toros's emphasizes its sustainably sourced ingredients and healthy menu options (salads and burrito bowls), flavor always comes first. Leo, in particular, is allergic to marketing that comes across corporate or preachy. "In the same way we don't want to lead with 'we're sustainable' we don't want to market ourselves as, 'oh we're a healthy dietary choice," he says. "The first thing is always 'we're delicious.'" The Chipotle comparisons may become an issue as Dos Toros looks to expand into smaller markets. Which is why as the company scales, Leo and Oliver are doing everything in their power to retain Dos Toros's scrappy and somewhat eccentric culture. From the start, hiring decisions were based on personality – both brothers have read and re-read Danny Meyer's book Setting the Table (HarperCollins, 2009) which hammers home the point that while you can teach technical ability, you can't teach warmth, engagement and respect. Culture, of course, is hard to maintain as a company grows. At first, Leo and Oliver made all the hiring decisions themselves; they'd post openings on Craigslist (which is still where they do all their recruiting), meeting up with applicants at coffee shops around the city. The ambient noise was a quick way to separate candidates who could project from those who couldn't, an important distinction when hiring for a job that requires constant communication with customers in a loud, crowded setting. Now, barring corporate positions, they’ve had to delegate the entire hiring process. While the brothers still put a premium on people -- entry-level workers are paid $10.10 an hour and hourly workers make, on average, between $14 and $16, a sizeable jump from even Chipotle's starting salary – expanding has meant forfeiting a lot of the day-to-day control. To combat this, the brothers continue to try and put Dos Toros's people and culture at the forefront, occasionally at the expense of convenience. Recently, when they hired a team of web designers to overhaul Dos Toros’s website, they were advised to scrap the existing headshots of each location's general manager and hiring manager because it would complicate the design process and possibly overwhelm visitors to the site. It was a fair point, but Leo resisted. He wanted his general managers and hiring managers to feel proud about where they worked, to visit the site and see their photos prominently displayed, explaining: "It's almost more for that person and that team to feel excited about it then it is for the user, you know?" This attitude – which places Dos Toros's people front and center – is top of mind as the chain shifts into high gear. If the brother’s expansion dreams are fully realized, Dos Toros will pepper the nation, just like Chipotle. And yet despite the brother's best intentions, it’s hard to imagine that if this scenario plays out, Dos Toros will be able to retain such a strong familial, wacky feel. For now, though, people come first. "If you have great people, you're going to win, basically," says Oliver. "And if you don't, you won't."